The An Phoblacht magazine will be a forum to hear alternative challenging views about Ireland and the wider international world today. Fáilte Mór to the readers of the new An Phoblacht magazine and the latest episode in the development of an alternative republican voice. 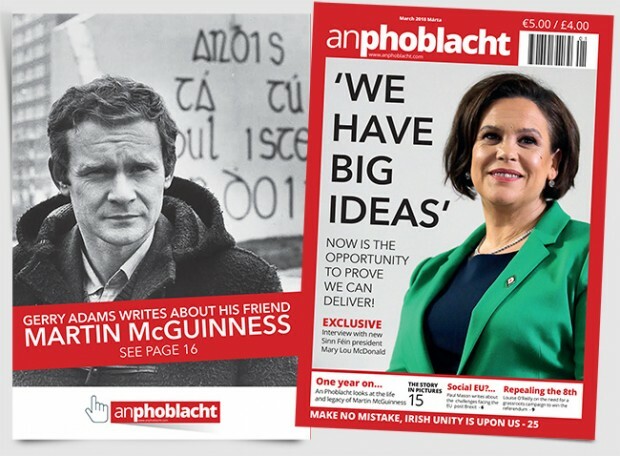 With An Phoblacht online and on Twitter and Facebook the quarterly magazine will be a longer read and a complementary publication to the daily An Phoblacht on your smartphone or desktop. The An Phoblacht magazine will be a forum to hear alternative challenging views about Ireland and the wider international world today. It will also give voice to our growing number of elected Sinn Féin representatives, this edition has a piece by Dublin North TD Louise O’Reilly on the Repeal the 8th amendment campaign. It will also profile voices and views outside of the Sinn Féin tent. This edition has articles by author and film maker Paul Mason, economic analyst and trade union activist Michael Taft, CWU organiser Ruairí Creaney, and author Kevin Meagher. Mason writes a compelling piece that highlights clearly the rifts and flaws in the EU today while pointing the way to a socially just Europe. Taft’s contribution is a call for us all to rethink how we approach economic issues. Creaney tackles the lack of social progress in Irish society. Kevin Meagher argues that a United Ireland is closer than you think! From leftfield comes Sinéad Ní Bhroin’s Postcards from a New Republic. Read it and see what you think. The historical pieces that were so popular in the old An Phoblacht are still here. Sinn Féin councillor and current Dublin City Mayor Mícheál Mac Donncha takes us back to the 1918 conscription crisis while Dublin TD Aengus Ó Snodaigh provides pen pictures of all the past presidents of Sinn Féin, which brings us to the centrepiece of this edition – an interview with new Sinn Féin President Mary Lou McDonald. One of the older versions of the An Phoblacht newspaper used a United Irishmen emblem as part of its logo. The harp emblem contained the words ‘It is new strung and shall be heard’. This is how we feel about the new An Phoblacht magazine. We hope you enjoy the read and keep current with An Phoblacht online and on Twitter and Facebook.